Update the look of your bedroom with this 3 piece duvet cover set. 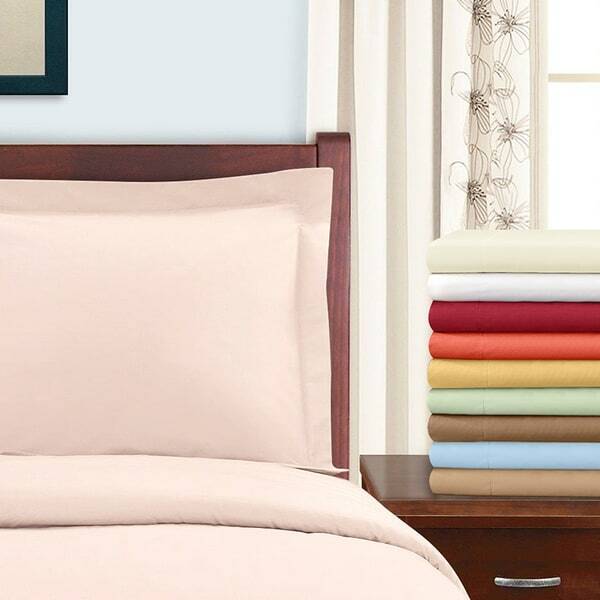 This set includes one duvet cover and coordinating pillowshams to provide complete relaxation. The lustrous texture and subdued colors lend a simple yet elegant look to your bedroom. Machine-washable construction allows for easy and convenientmaintenance. I should have returned the "set" immediately, but thought a washing would fade the shams so that they would match the much paler cover. The duvet cover was flimsy, so I attached a print sheet to it and have a somewhat reversible duvet. I was very disappointed in myself for not returning it. The shams and duvet cover bore no resemblance to each other color-wise. I expect Overstock would have refunded my purchase, they always do, but I couldn't bring myself to return a washed set. I am a little disappointed in this duvet cover. First of all, the measurements online were incorrect. It stated 108 x 90 and the package says 106 x 92. I spent a lot of time online looking for a 108 x 90 duvet cover. It fits ok, so I'm not too upset about it, but it was deceiving. Second, it was very pretty when I took it out of the package and when I washed it, it lost a lot of its luster. Third and finally, after I washed the cover, it came out with little thread pills all over it. I had to lint roll the whole thing, on both sides. I hope this is just a first time wash incident. So overall, the cover is ok. I have been looking forward to its arrival and was a little let down. I was absolutely thrilled when I received this. The taupe color matches my other bedding pieces to the "T". The surprise was not only the duvet, color and quality for the price, but the two king size pillow shams that came with the cover. I have been trying to coordinate colors with a Waterford bedding ensemble and trying to find something to cover and protect my oversized down comforter (purchased from Overstock last year) has been a challenge, to say the least. This cover completes my search!!! Love it. I bought the Taupe Duvet and the color and fabric are really nice. The photo shown has a satin strip on the top and the duvet does not. It must be a photo of the sheets. It's very soft, washes well and has minimal wrinkles coming out of the dryer. My comforter is 90 x 98 so I was a bit concerned on it fitting into the 90 x 90 duvet cover. But it has worked out very well. It's extra poofy which I prefer to having too much slack on one side or another. I really like this product and think it's a very good value for the cost. This duvet set is nice, and a great value for the price. The duvet design is a simple as it can get, with a flap and button closure at the bottom and basic seaming. The duvet is made from a single piece of fabric so there is no seam at the top. The shams are slightly more tailored, with a flange around them and an overlap opening on the backWe ordered the light blue and it is very pale with a slightly silver cast to it. I washed it per the instructions before use, and it came out of the dryer looking just right, not wrinkled.The only reason I didn't give this 5 stars for comfort is that I was replacing an old duvet cover that is magically smooth and cool feeling. If you're just looking for soft and sheet-like you'll be happy with this one. I ordered a twin size in this duvet cover and was very pleased with color and quality however, the size of the duvet was 68x68 NOT 68x86 as described in the porduct details--I honestly don't know what bed this would fit! This is the worst thing I ever bought from Overstock. It is so bad, that have not bought anything there in a long time until today. I have historically been a fairly regular customer, and especially like the bedding and linens. I am really angry with myself for not returning it after first wash - I always wash bedding before using. From the get-go, it was obvious that it was very poorly made, the cotton was mediocre, and the seams started tearing the first time I put it on my comforter. I had intended to come back and write this review for a long time, but never did it. I would give it zero stars but I am not sure if that is an option. The duvet is a very pretty, rich color (burgundy) but I've only had it on a day or 2 and I'm really not sure I want to keep it. I intentionally bought one with a lower thread count to keep it from being too heavy (or hot). I don't need a lot of warmth to sleep and we have another one with a 600 thread count and it is soooo heavy it's actually hard for me to lift when the comforter is in it. But, that one is Egyptian cotton and it feels so much better against the skin than this one does. It's just not as soft as I'd hoped (I pre-washed) but it still feels hotter than I like. I absolutely love this duvet and sham set. I ordered the gold to go with a light seaglass blue/green in my bedroom, and the colors go beautifully together. The fabric is super soft, and though it does wrinkle when dried, the wrinkles work themselves out within a few hours. The gold is definitely more of a gold/mango than a true gold gold/yellow, a very soft, warm tone. The color and price sold me when compared with other options on overstock. The only thing I don't love is that fuzz and lint are hard to remove from the fabric. Nothing a lint brush couldn't handle, but it would be nice to clean with a swipe of my hand (I guess part of the trade off of having a soft cotton duvet). Overall, fabulous for the money, I don't regret my purchase one bit! this duvet is really a great buy for the money. Does anyone remember the days when one purchased Egyptian cotton and it was silky and the more you wash it the silkier it got? Gone are those days. Now it seems as if brushed cotton is being passed off as egyptian cotton. This is no exception, although it feels more like egyptian cotton than the numerous other products I have purchased attempting to find one. With that said, if you are looking for a duvet that does not hold pet hair and down feathers, keep moving. I purchased the King Size in Gold - which is actually more of a yellow mustard in color. It's not very soft, but has held up well with washing...just remove promptly from the dryer, otherwise you'll have a ton of wrinkles. Low price and low quality. The selvage shows on one seam. I was just a little disappointed in the fit and washing, but I didn't pay that much for it. would not recommend this product. The cover had a hole in it. I did not notice until I had washed it and put it over my white feather comforter. The white really showed up thru the red cover that I had purchased. Too late to return since I had washed it. It does really wrinkle pretty badly. The one positive was the color is nice and the size was big enough for the comforter to fit well in it. Due to the hole and wrinkle issue, would not recommend this. Silky soft but lasts and lasts. After more than 20 washings, this set still looks great right out of the dryer. The duvet is perfect used alone for a light summer covering, but filled with a winter down topper, it is cozy and warm. Amazing duvet so soft and a such a great price! What more could you want in a sateen duvet? For me, the answer is nothing. Great quality, affordable price, very attractive. Soft. Worth the price. Highly recommend. This is wonderful and I love it. It is several years old now and has been washed many many times. The cotton fabric cannot be beat! A really beautiful duvet set. The sateen is not too shiny, which I was a bit concerned about. Wears very well, even through all the laundering with bleach. A good buy. "Is this product returnable if the color is not right ? " "can you bleach the white cover?" Hello erinkoz, you are able to lightly bleach the white cover. Thanks for shopping with us! "I was wondering if I could get a little more clarification as to the "beige" color. It almost looks like a rose gold." Hello cforan1017, the colors may vary slightly due to monitor differences. The beige color is a deep beige with slight gold undertones. Thank you for shopping with us! A.C.
"Care instructions: Machine washable. At what temperature is it recommended to wash the set? Thanx"
Hello limistra, To keep your Egyptian cotton sheets in good condition, use only cold or warm water when washing them and avoid using any harsh detergents. Thank you for shopping with us! Thank you for your interest in the Egyptian Cotton 300 Thread Count Solid Duvet Set. The company that makes them is in the United States but they are constructed in Bangladesh. We hope that helps. Have a great day. "Will there be a King size in peach available?" Thanks for your interest, sorry unfortunately items are restocked as they become available, however we cannot guarantee an item will be restocked. Please feel free to check back with us periodically to see if the item has returned.